#2020InSight Report shows how the dawn of the Fourth Industrial Revolution and a productivity crisis are setting the stage for the cloud-fueled workplace of the future. NEW YORK; July 13, 2017 -- WorkMarket, the OS that intelligently automates today’s modern workforce, has released its 2020 In(Sight) Report: What AI & Automation Really Mean For Work, shedding light on the rapidly evolving state of work as digital transformation collides with the on-demand labor revolution. The report looks specifically at these trends from both the viewpoint of business leaders, and employees. Automation holds real business potential, despite differing viewpoints among business leaders and employees. More than half (52% vs. 29% employees) of business leaders are interested in workforce automation. Employees are most likely to say they feel indifferent (32% vs. 10% business leaders) about automation. Automation has more immediate and applicable value than Artificial Intelligence, at least for now. 41% are currently using workforce automation technology while only 13% are using Artificial Intelligence technology. More than half of business leaders (56%) plan to implement workforce automation technology in the next 3-5 years compared to 44% for Artificial Intelligence. The prospect of automation is real and within sight for many businesses. 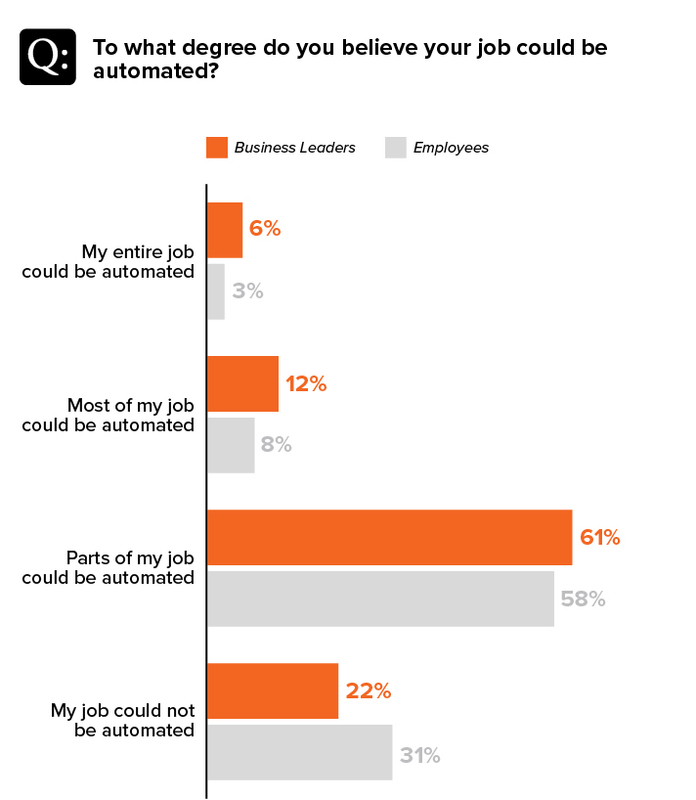 74% of respondents, both business leaders and employees, believe that at least parts of their job could be automated. 61% of business leaders believe that automation can be somewhat or very easily utilized in their industry and jobs within their industry in the next 12 months. While IT issues, data processing and time entry are the biggest distractions, they’re also the most automatable tasks today. IT/technology issues ranked highest by both business leaders (43%) and employees (29%) as the task most keeping them from doing more important work. 70% of business leaders believe that 10% to nearly 40% of their time is devoted to tasks that are mundane and not core to their job description, equating to approximately 45 minutes to 3+ hours of an 8 hour workday. An overwhelming majority of respondents believe automation possesses real value, and could save them hundreds of hours a year. 90% of respondents believe there are advantages to automating tasks at their organization, particularly a reduction in manual errors (48%), an increase in the speed at which tasks are completed (42%) and better quality work product (38%). 53% of employees believe they could save up to 2 hours a day by automating tasks; that equates to roughly 20 hours a month. 78% of business leaders believe they could save up to 3 hours a day by automating tasks; that equates to roughly 30 hours a month. The report found that while business leaders struggle to gain more productivity from their workforce, workers have been bogged down with manual tasks that have little to do with their job. As business leaders experiment with technology to find better approaches to work, they expect automation of their workforce to help combat declining productivity and alleviate inefficiency and employee burnout. The WorkMarket study explores how automation will empower humans to do their jobs better, adding to a growing consensus among innovation leaders that the future will see humans use advanced technology to find better ways to get work done. 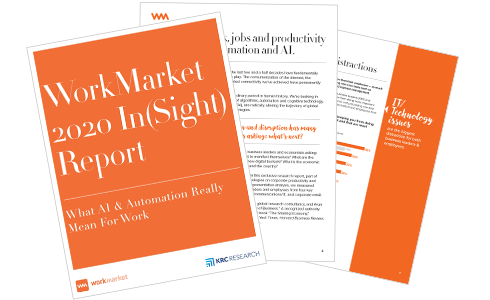 The 2020 In(Sight) Report: What AI & Automation Really Mean For Work was commissioned by WorkMarket in partnership with KRC Research as the most comprehensive study of its kind. The report surveyed 200 business leaders and 200 employees across four key industries: media and publishing, financial services and insurance, telecommunications and IT, and corporate retail. The survey was fielded online in April 2017, focusing on workforce productivity, business impact, effective workforce management practices, the use of contract labor, and compliance. To obtain the full report and dive deeper into how work is changing, click here. WorkMarket has set out to build a brighter future for work. Partnering with innovation leaders like Accenture and ServiceNow, WorkMarket helps enterprises transform their operations from the cloud up, opening a new world of productivity and profitability. By focusing on the fusion of a flexible workforce and work automation technology, WorkMarket’s cloud-based software sets new standards for modern competitiveness. From enterprises looking to achieve more with less, to highly skilled independent professionals seeking compelling contract work, the WorkMarket platform streamlines management for a modern workforce. To learn more, visit https://www.workmarket.com. For any questions or press inquiries about the 2020 In(Sight) Report, please contact WorkMarket Director of Marketing Mousa Ackall at [email protected] or 678-662-7371.